I have built a number of duct toriods but I've found then to be easily bashed and very ugly. I was looking for something that would be. Large - but not so large that it won't go into the car boot. 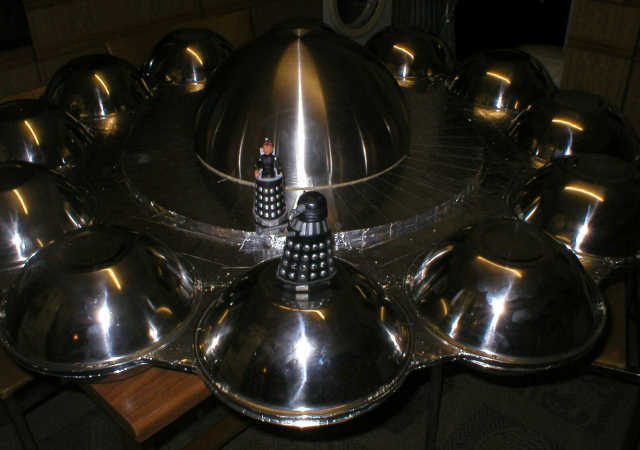 Good looking - the whole point of a tesla coil is a visually impressive display. A four foot square sheet of 3/8 plywood. 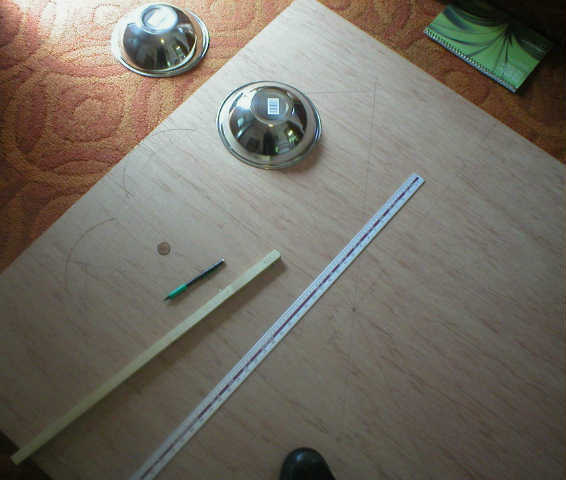 To mark it out all that is required is a ruler and a stick with a couple of nails through it to mark out circles. 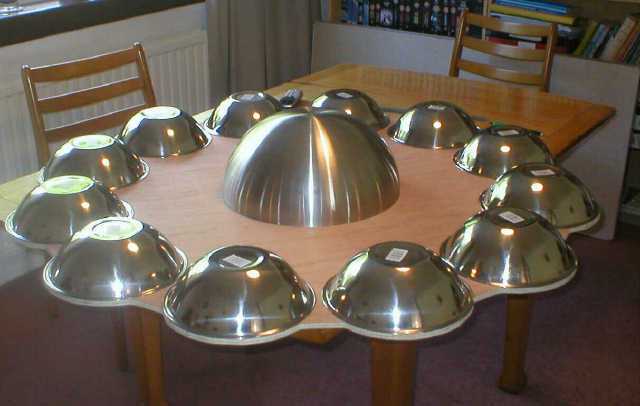 The plywood was easy to cut but tended to flex and was strengthened with a centre piece of 1/2 chipboard, 2 ft diameter and of course by the bowls them selves. 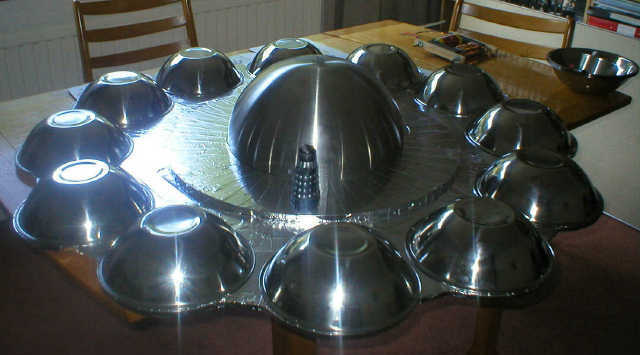 The centre sphere is a large salad bowl from IKEA, its on the top only. It is there because it looks pretty rather than for a few extra picofarads of capacitance. A circular piece of wood was added in centre to stiffen it, now its assembled it is quite rigid. The wood is covered with aluminium foil tape. It was at this point that a particularly unpleasant alien race started to take an interest. 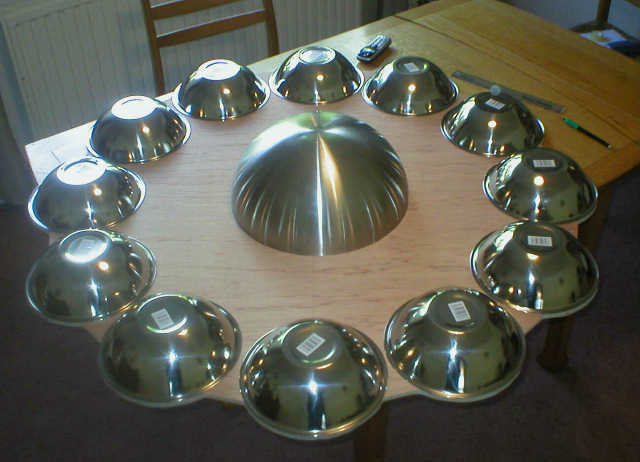 The bowls are attached with 4 screws through holes drilled in the rims. The weak point of this design is the outer rim however it is shaded by the bowls and I am fairly sure that it will breakout only at the breakout point. Rimless bowls would have been better - but harder to mount and much more expensive. These bowls were 40p each even at Ikea the rimless bowls are £5 each. 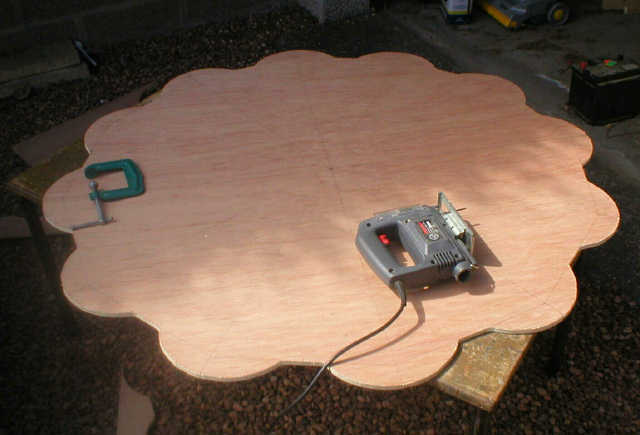 I have also cut the wood for the second dodecadonoid the enventual aim will be to use these with the pair of Frankenstien coils.